Editor’s Note: At the World MoneyShow Orlando, Roger Conrad recorded two video interviews: one about two of his favorite master limited partnerships and another about Canadian dividend payers. More than five years have passed since TransCanada Corp (TSX: TRP, NYSE: TRP) announced plans to build the Keystone XL pipeline. And the fate of the proposed conduit from the Alberta’s oil sands to Steele City, Neb., is uncertain as ever. But the uncertainty surrounding the project hasn’t cooled our enthusiasm for TransCanada, which should thrive regardless of whether the US government approves the controversial, cross-border leg of the pipeline. This week, a Nebraska judge threw more oil on the fire by voiding state law approving the pipeline’s route. The state attorney general has already appealed the ruling. And in any case, the judge’s order has thrown the case back to the state Public Service Commission (PSC), which, to date, has supported the project. At a minimum, the Nebraska decision delays the project by forcing proponents to either win on appeal or secure the PSC’s approval, which could take up to seven months. That, in turn, takes the pressure off the Obama administration to reach a final ruling before the November 2014 Congressional elections, a decision that would otherwise risk angering either the environmental lobby or labor unions. Keystone XL”s fate has increasingly become one of those issues in the political sphere where there’s little incentive to compromise. Both friends and foes of the pipeline are firmly dug in, with both sides raising and spending millions of dollars trying to convince Congress and the public of their case. Opponents have brushed off the Environmental Impact Statement released by the US State Dept on Jan. 31, 2014, which found the pipeline wouldn’t dramatically increase carbon dioxide emissions. Many proponents, meanwhile, see the latest delay as a handy cudgel to use against Democrats in the upcoming election. The question for investors is who is hurt by the delay and possible defeat of Keystone? Ironically, it’s not the developer-in-chief, TransCanada. True, repeated delays have increased project costs. But they’ve also increased demand–and prospective returns if the pipeline gains approval. Best of all, the company has ample opportunity for growth even if the cross-border leg of Keystone XL never comes to pass. This month, TransCanada commenced operations on Keystone XL’s southern leg, a pipeline segment linking the oil trading hub in Cushing, Okla., to Gulf Coast refineries. Management expects this portion of the pipeline, which state and federal regulators embraced enthusiastically, to reach its full capacity of 700,000 barrels per day by year-end. The most recent cost estimate for the controversial, cross-border segment of Keystone XL stands at $5.4 billion. TransCanada won’t update this figure until construction begins. Odds are that the cost to build the pipeline have increased significantly. However, even a 50 percent increase in costs would leave Keystone XL’s cross-border leg at less than one-fifth of the CA$38 billion in new energy projects TransCanada has in various phases of development. All of this backlog is “commercially secured,” with revenue locked in by contracts that commence once the assets come onstream. And the company made its final investment decision on about US$19 billion worth of projects over the past year, suggesting that the company’s stream growth opportunities continues to expand. The payoff from some of these projects is decidedly long term. The biggest by far, for example, is the proposed CA$12 billion Energy East Pipeline, which would transport crude oil from Alberta to refineries on Canada’s East Coast. The pipeline’s projected in-service date of 2018 reflects the need for regulatory approval from federal and provincial authorities, as well as consultation with Canada’s First Nations. Even leaving out Energy East and Keystone, however, TransCanada still boasts more than CA$20 billion in projects that can be put into service relatively quickly and with little controversy. They range from extensions and expansions of existing pipelines and other midstream assets to nine solar-power projects in Ontario that should come online later this year. These already contracted deals could generate at least CA$1.40 per share in additional dividends annually by the end of 2018. That’s assuming a relatively conservative 10 percent return on equity and an even split between debt and equity financing. And the estimate doesn’t include the impact of additional pipelines and power projects. TransCanada this week raised its dividend by CA$0.02 per share–an increase of 4.4 percent. Controversy about the Keystone XL pipeline aside, TransCanada boasts an impressive pipeline of projects that provides a highly visible source of future growth. That’s the reason TransCanada’s stock appears in Energy & Income Advisor’s International Energy Portfolio, which has delivered an average total return of 7.7 percent since its inception on Nov. 15, 2013. Over the same period, the S&P 500 returned 2.7 percent. This actively managed model Portfolio–available exclusively to Energy & Income Advisor subscribers–focuses on my favorite dividend-paying energy stocks in Australia, Canada and beyond. Although TransCanada has a lot to gain from building the cross-border segment of Keystone XL, the firm loses relatively little if the project never comes to fruition. Not so for Canada’s small oil producers, which have already lost big time from insufficient takeaway capacity to transport their output to market. And this situation likely will get worse before it gets better. The Environmental Impact Statement published by the US State Dept on Jan. 31, 2014, concluded that building Keystone XL would add “negligibly” to greenhouse gas emissions. This finding assumes that alternative means to transport crude oil to market will ensure that producers continue their activity in Canada’s oil sands. Thus far, operators have used railcars, barges and trucks to move their output to demand centers. For example, Cenovus Energy (TSX: CVE, NYSE: CVE)–one of the more than 70 dividend-paying energy stocks I track in Energy & Income Advisor’s International Coverage Universe–announced this month it would sub-lease 200 more rail cars than last year, bringing its total rail capacity up to 30,000 barrels of oil a day. Not a subscriber? 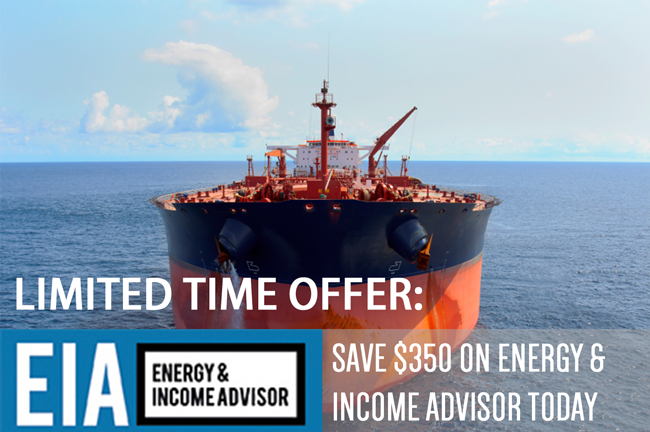 Get instant access to my International Energy Coverage Universe and my favorite dividend-paying Canadian Energy Stocks when you join Energy & Income Advisor. Cenovus Energy, which raised its dividend by 10 percent, increased its proved bitumen reserves by 8 percent in 2013 to 1.8 billion barrels, bringing the firm’s estimated undiscovered and discovered resources up to 143 billion barrels of crude oil. And management forecast that new projects would add 400,000 barrels to 500,000 barrels of daily production by early 2015–hardly a sign that the uncertain fate of Keystone XL has prompted producers to curtail their activity in the oil sands. However, investors must bear in mind that Cenovus Energy is a large company with a market capitalization of almost CA$20 billion. Smaller producers lack these resources. And the higher shipping costs associated with alternative forms of transportation have taken a bite out of their profits. 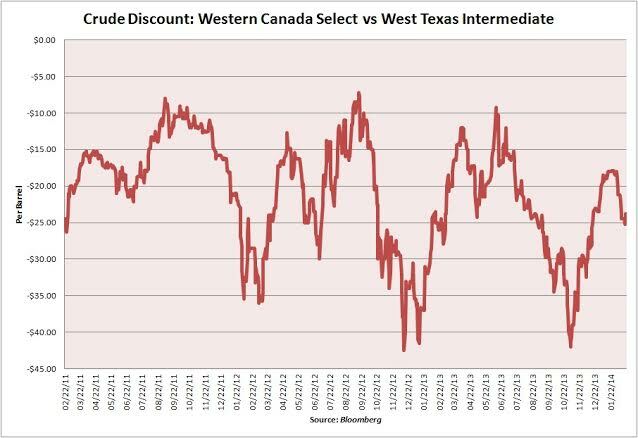 At the same time, these transportation bottlenecks have kept the price of Western Canada Select (WCS), a heavy-sour blended crude oil, well below the price of West Texas Intermediate (WTI), the benchmark that trades at the hub in Cushing, Okla.
Over the past three years, the WCS-WTI price differential peaked at a discount of about US$40.00 a barrel. Today, the spread sits at almost US$24.00 per barrel. Although US producers sold their crude oil at US$90.00 per barrel to US$100.00 per barrel, Canadians have earned between US$60.00 and US$70.00 per barrel. This wide price differential creates a massive incentive to add takeaway capacity to move crude oil from Canada to the US. And this price gap will only grow as Canadian producers ramp up their activity. These challenges create huge opportunities for TransCanada and other midstream operators that own oil and gas pipelines. I highlighted several other names that stand to benefit from this trend in Canada’s Midstream Marvels, an article that’s available exclusively to Energy & Income Advisor subscribers. Non-subscribers can save $350 on an an annual subscription by signing up today. Keystone XL’s 830,000 barrels per day of capacity would alleviate the worsening bottleneck. However, even in the best-case scenario, the pipeline wouldn’t start up until at least two years after permitting. The deep pockets behind the oil sands development—Cenovus Energy is far from the largest player—means these projects will advance before new shipping capacity comes onstream. But smaller producers will feel the squeeze from low price realizations and higher transportation costs. The worst-positioned upstream operators also face liquidity constraints. All these factors suggest that consolidation will come to Canada’s energy space. The new year has already brought one big deal, with Canadian Natural Resources (TSX: CNQ, NYSE: CNQ) purchasing some of Devon Energy Corp’s (NYSE: DVN) Canadian assets for CA$3.1 billion. With all the focus on whether or not Keystone XL gains approval, many investors overlook the probability of further consolidation in the Canada’s energy patch–a potentially profitable trend.